HAMMOND, Ind. (WLS) -- A four-vehicle crash snarled traffic on westbound I-80/94 near Indianapolis Boulevard in Hammond, Ind., Monday morning. One person suffered non-life threatening injuries in the accident. Indiana State Police said a 1999 Nissan Pathfinder spun out of control around 5:30 a.m. shortly after the driver entered the westbound Borman Expressway from Indianapolis Boulevard and tried to move into the middle right lane. The driver of a semi truck owned by North Carolina's Sharp Transit in the middle right lane tried to avoid the Pathfinder, police said, but the semi hit the SUV and forced it into the left lanes. The driver of a 2008 Nissan Altima in the left lane also struck the Pathfinder after trying to avoid it, police said. A 2009 Dodge Avenger struck the Altima when the driver was unable to stop. The driver of the Altima was taken to Munster Community Hospital with non-life threatening injuries. All westbound lanes of I-80/94 were closed at Indianapolis Boulevard for about an hour while emergency crews cleared the scene. Westbound traffic backed up for more than four miles during the morning commute. 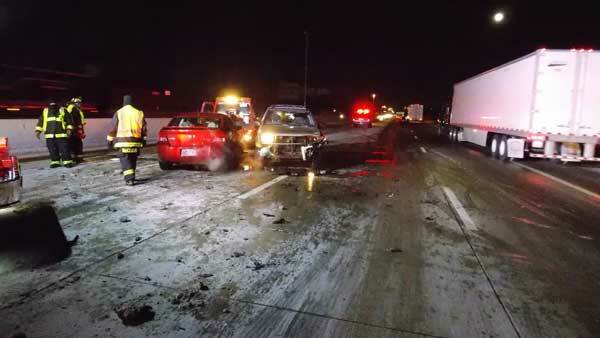 The driver of the Pathfinder was cited for unsafe lane movement and expired license plates.